NOW YOU KNOW WITH YORKTOWNJOE – G.I.JOE MARVEL ISSUE #14 REVIEWED! 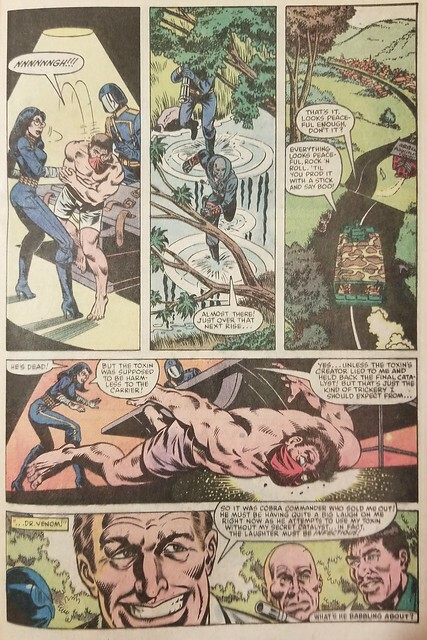 This is a continuation of a story arc, specifically carrying over from Issue 12, Three Strikes for Snake-Eyes, and Issue 13, Last Plane From Rio Lindo. If you haven’t read those issues, or my reviews of the issues, I highly suggest you start there before proceeding here. But to each their own! But if you can’t be bothered, read on. …and now we see they are alive, but in trouble. The bunker is far from water-tight and the river water is seeping in. They are still fighting but realize they need to cooperate if they are going to survive. Over at Cobra HQ, we see the Baroness consorting with the shadowy figure first glimpsed in Issue 11. There is a hint of divided loyalty between this figure and Cobra Commander. Author Larry Hama employs a literary technique to introduce the new character. He begs the Baroness to say his name. Destro is the mysterious character and his rise to prominence will only continue now that he is revealed. The reader is left to speculate as to the relationship between the Baroness and Destro. For now, let’s just say they know each other. The Commander and the Baroness discuss the planting of the microdot evidence that is designed to lead the Joes into a trap. Allowing the Joes to live and find the evidence was really a ploy to bring the Joes to the location of his choosing. What an evil genius! Next we see Scar-Face and Destro discussing what really happened. Destro had him switch the microdot for another one of HIS choosing. This is designed to lead the Joes to another location. And not where the Commander has a trap planned. Meanwhile, the water is climbing for the 3 in the bunker, and they are working on a plan and some physics on how to get out. Destro finds out that the Commander is headed to Springfield and that the Baroness is his pilot. Evidently he didn’t know this or he wouldn’t have leaked the location to the Joes with the second microdot. You would think there would be something in the 3rd party contractor policy handbook demanding non-disclosure of critical information that could get the Commander captured or killed. Kwinn hold his breath and dives under the water once the bunker is full and the water pressure inside is equalized with the pressure outside. 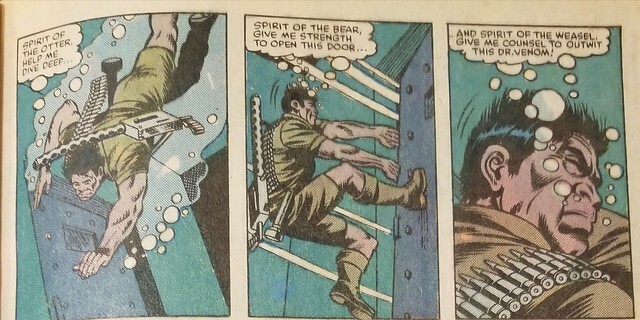 He pushes mightily to get the door open, and we see his reflective thoughts as he works in peril to save all 3 of them from doom. 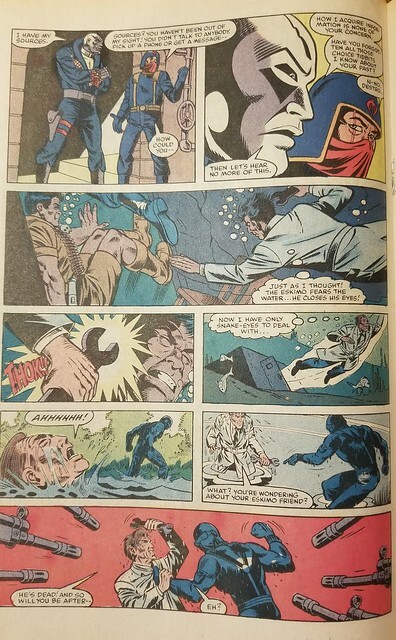 As he holds the door open for Dr. Venom and Snake-Eyes to swim out, Dr. Venom hits him in the head with a wrench. Dr. Venom is a certifiable homicidal maniac. He will kill just to kill, just because he is evil. There was really no tactical advantage to him for having Kwinn dead. In fact, he would have been better off pitting Snake-Eyes and Kwinn against each other. But he’s just a creep. 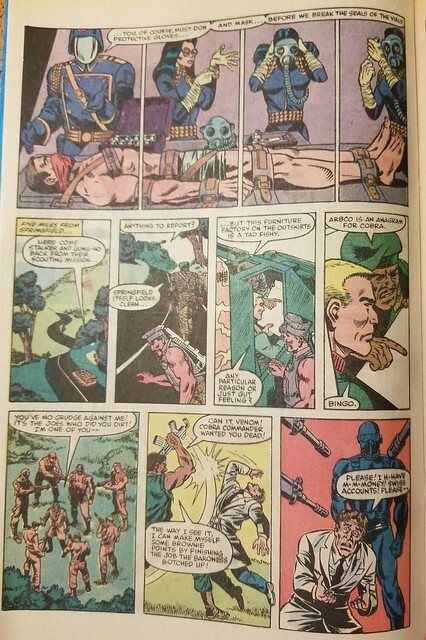 Snake-Eyes and Dr. Venom get to the surface and resume fighting, but are greeted by Cobra mercenaries disguised as Sierra Gordo renegades. They reveal they are from Cobra and were sent to rescue the Joe team from the real renegades. Back at Cobra HQ, things get a bit creepy. A poor Cobra trooper is strapped to a medical table in his boxers and mask. Cobra Commander watches while the Baroness puts on latex gloves and a gas mask. Whoa, whoa, whoa. 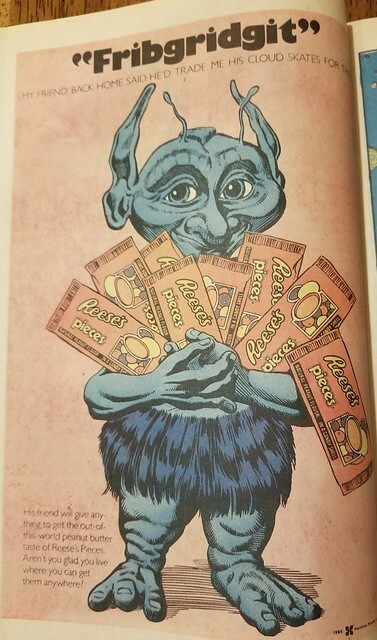 This should not be in a kid’s comic!! 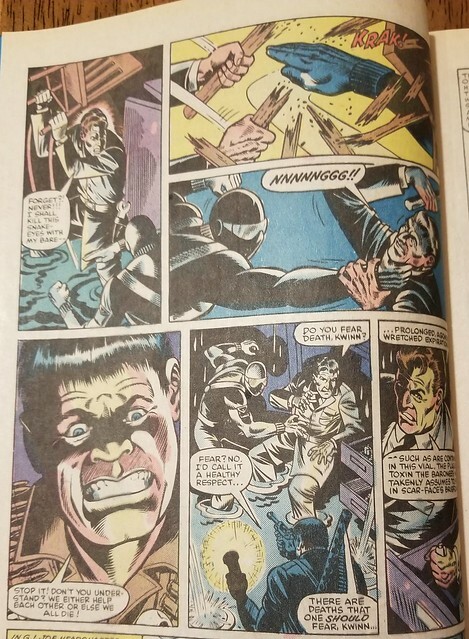 As it turns out, they are using this poor unfortunate soul to experiment with a plague toxin that Dr. Venom had created. Let’s just say that is not going to end well. 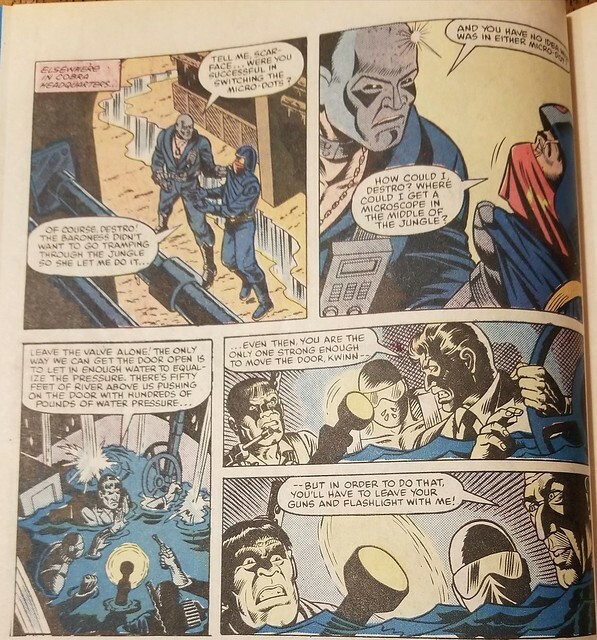 Destro realized the Joes were headed to Vermont to capture Cobra Commander and doesn’t want the Baroness harmed by accident. He and Scar-Face and some paratroopers drop in and run for quite a while to stop the Joes who had air-lift/dropped a new vehicle, the A.P.C. The paratroopers complain that the pace is going to kill them, and Destro replies with a pretty harsh one-liner. Let’s just say if Destro was our Phy. Ed teacher, we would all be dead. 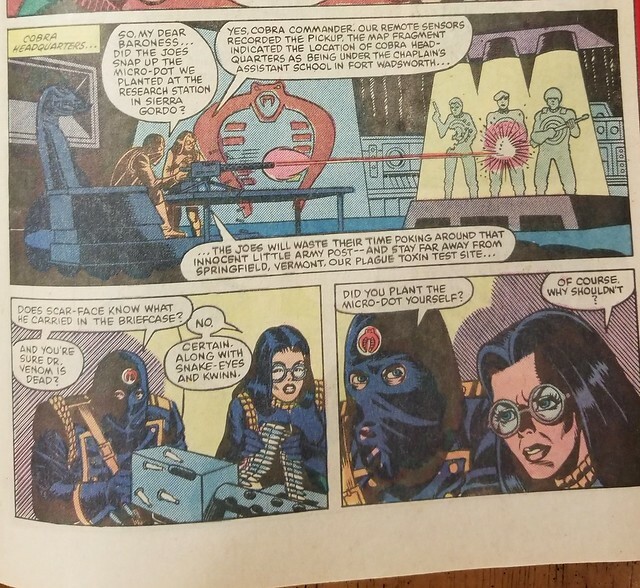 And speaking of friendliness and brotherly love: the mercenaries are differing on how to prove to Cobra Commander that the Baroness did not get the job done, but THEY did. This gratuitous discussion borders on pushing the envelope. Destro is keeping up a strong pace but one paratrooper is dropping back. Scar-Face is instructed to kill him and take his place in the rear. Once again, enrollment is down at the Destro School of Motivational Management and Employee Retention. But as we flash back to the Cobra lab, the Baroness and Cobra Commander have unstrapped the “volunteer” after injecting him with the plague toxin. The idea is to have him spread it to others. 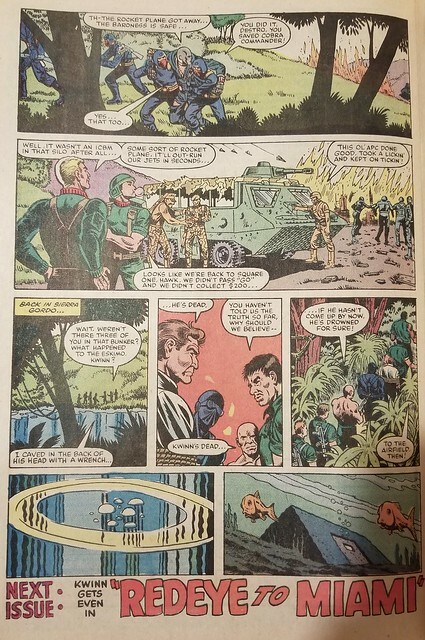 So whatever Mission Impossible movie had that as a plot, yep, swiped it from Larry Hama. Of course, the volunteer made it about two steps before keeling over and dying a horrible death. 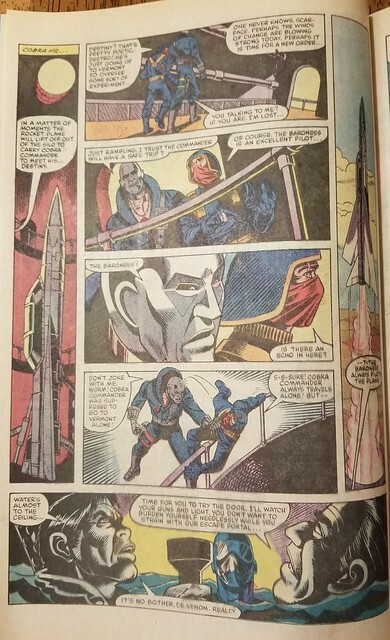 One of the Cobras gets a message that the Joes are upon them and Destro is fighting them off to make enough time for the Baroness and Cobra Commander to get away. There are some heroic moments as Destro and Scar-Face are fighting off the Joes just long enough for the rocket plane to get them away safely before new Joe pilot ACE and the Skystriker blow the hangar and base to smithereens. There is a significant amount of intrigue in this issue, and to catch all of the subtlety, I highly recommend getting Issue 14 and reading it. MY recap and review can give you some of the information, but there is nothing like reading and re-reading a good story to catch what you might have missed the first time through. Destro is heroic, but only to save the Baroness after setting up Cobra Commander to be captured or killed. Dr. Venom left out an ingredient, or added something to cause Cobra all kinds of problems. 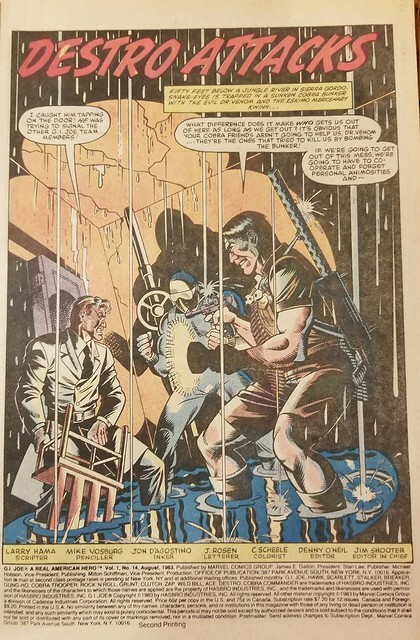 And it is good to see the teaser at the bottom for the next issue: “Kwinn gets even in REDEYE TO MIAMI.” So we know that he didn’t drown. I think he may give Dr. Venom a poor review on the mercenary/contractor feedback form. And Dr. Venom certainly is not pleased with the news that Cobra Commander ordered the Baroness to kill him. But he and Snake-Eyes are in the grasp of the Cobra mercenaries. So things could be better. But where there is life…there is hope. 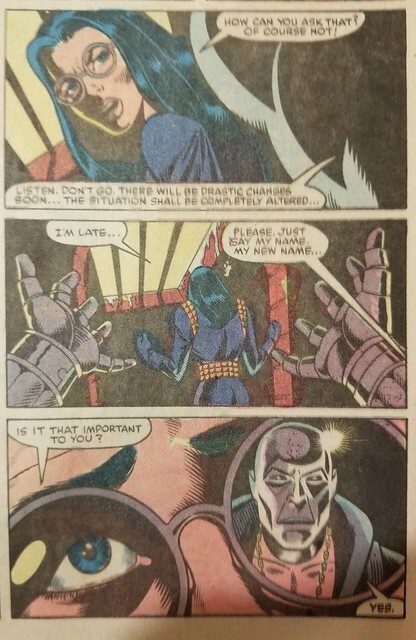 Now You Know – a little more about the “Destro Attacks!” Next week will be Issue 15, “Red-Eye to Miami!” (Which may turn out to be the real last flight from Rio Lindo.) Feel free to leave a comment or give your thoughts AFTER THE JUMP. Tagged Baroness, Cobra Commander, Destro, G.I.Joe, G.I.Joe Comics, Marvel Comics, Snake Eyes. Bookmark the permalink.